Stainless Steel • Brass • Aluminum • Nylon. Available in 4-40, 6-32, 8-32 and Metric Threads. Keystone offers a comprehensive range of precision made American standard as well as Metric size threaded standoffs. 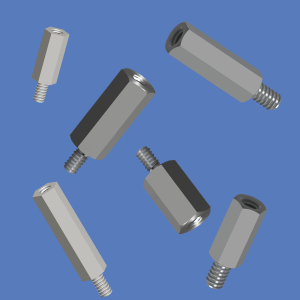 Our standard Hex Male/Female Threaded Standoffs are available in Aluminum, Brass, Stainless Steel and Nylon materials. Aluminum spacers feature a Clear Iridite finish as per MIL-C-5541; while Brass Standoffs feature a Nickel finish as per QQ-N-290 and the insulated Nylon 6/6 Standoffs are in a natural color. Corrosion resistant Stainless Steel Standoffs are per ASTM-A581/582, Class 303. Also available in lengths for PC/104 and PC/104-Plus Modules as well as a single-board hardware mounting kit. While our standard products meet most customer requirements, modifications as well as custom fabrications can be manufactured to meet your specific needs. To locate a specific Keystone part number and/or specifications that meet your requirements, you can go to our Part Builder System and choose the precise product attributes you require or make a selection from the accompanying chart. Application engineering services are available to meet special customer requirements. Aluminum • Brass • Stainless Steel • Nylon • Phenolic. Available in 2-56, 4-40, 6-32, 8-32, 10-32 and Metric M2.5, M3 & M4 Threads. Our standard Hex & Round Threaded Standoffs are available in Aluminum, Brass, Stainless Steel, Nylon and Phenolic materials. Available in Push-In, Lock-In and Screw Mountable Styles. Durable and lightweight, spacers/supports are manufactured from flame resistant Nylon, UL rated 94V-0. 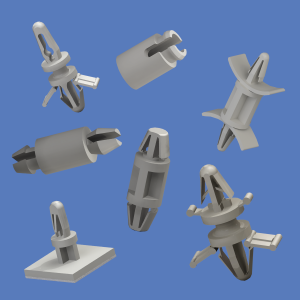 They feature one-piece molded construction which ensures consistent, close tolerance dimensions and high strength. For PC/104 and PC/104-Plus Modules. Available in Aluminum, Brass, Stainless Steel and Nylon. Recognizing the rapid acceptance of PC/104 and PC/104-Plus modules, our standoffs meet the need for use in limited space applications. 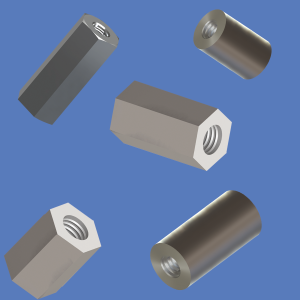 The standoffs, measuring .600 [15.3] in body length, may be used with any of the more than one hundred different PC/104 modules offered by more than three dozen manufacturers. End products using the new modules and requiring the standoffs include computer power supplies and multi-board stacks. Our Aluminum Standoff, p/n 6799 (http://online.keyeuro.eu/pdf/6799.pdf), features a Clear Iridite finish; Brass Standoff, p/n 8799, features a Nickel finish as per QQ-N-290; Stainless Steel, p/n 5799 is ASTM A581 / A582 and our Nylon 6/6 Standoff, p/n 4799, is supplied in a natural color. 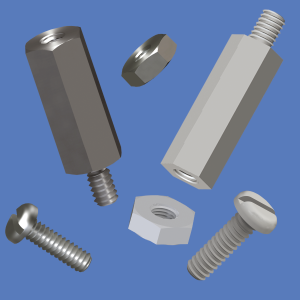 Keystone’s PC/104 hardware mounting kits includes all the hardware required to mount a single-board and is supplied with 4 each: #4-40 threaded spacers .600” length, #4-40 x 1/4 screws, and nuts.